While my last name comes from Sweden, I'm writing this in the United States and will no doubt be obliged to acknowledge that the militarist threat from tiny Sweden hardly compares with that of the Pentagon. While Sweden is fifth in dealing weaponry to poor countries and ninth in dealing weaponry to all countries, we all know who's first. Sweden is, in fact, a customer for U.S. weapons sales, although its military spending does not approach that of the United States even considered per capita. While Sweden has 29 troops in Afghanistan, it's hard to imagine they are doing the bulk of the damage. And while Sweden actively participates in NATO wars, trainings, and propaganda, it's still not technically a member. 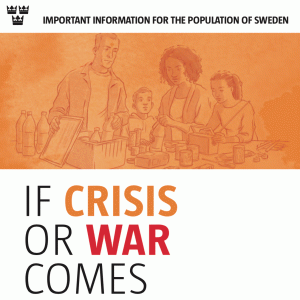 As we all have a stake in Japan maintaining Article 9, and in the position toward peace and war of every government on earth, we all should be alert to the dangers found in Sweden's brochure, "If Crisis or War Comes." Of course, war doesn't just come. War hasn't come at all to wealthy well-armed countries since World War II. They have taken it to the poor countries of the world, often generating support back home through promoting the fear that war might "come" or through equating smaller-scale crimes with war. Tragically, the actual wars have generated the smaller-scale terrorism used to justify preparations for more wars. Terrorism has predictably increased during the war on terrorism (as measured by the Global Terrorism Index). 99.5% of terrorist attacks occur in countries engaged in wars and/or engaged in abuses such as imprisonment without trial, torture, or lawless killing. The highest rates of terrorism are in "liberated" and "democratized" Iraq and Afghanistan. The terrorist groups responsible for the most terrorism (that is, non-state, politically motivated violence) around the world have grown out of U.S.-led wars against terrorism. Those wars themselves have left numerous just-retired top U.S. government officials and even a few U.S. government reports describing military violence as counterproductive, as creating more enemies than are killed. According to the Peace Science Digest: "Deployment of troops to another country increases the chance of attacks from terror organizations from that country. Weapons exports to another country increase the chance of attacks from terror organizations from that country. 95% of all suicide terrorist attacks are conducted to encourage foreign occupiers to leave the terrorist's home country." 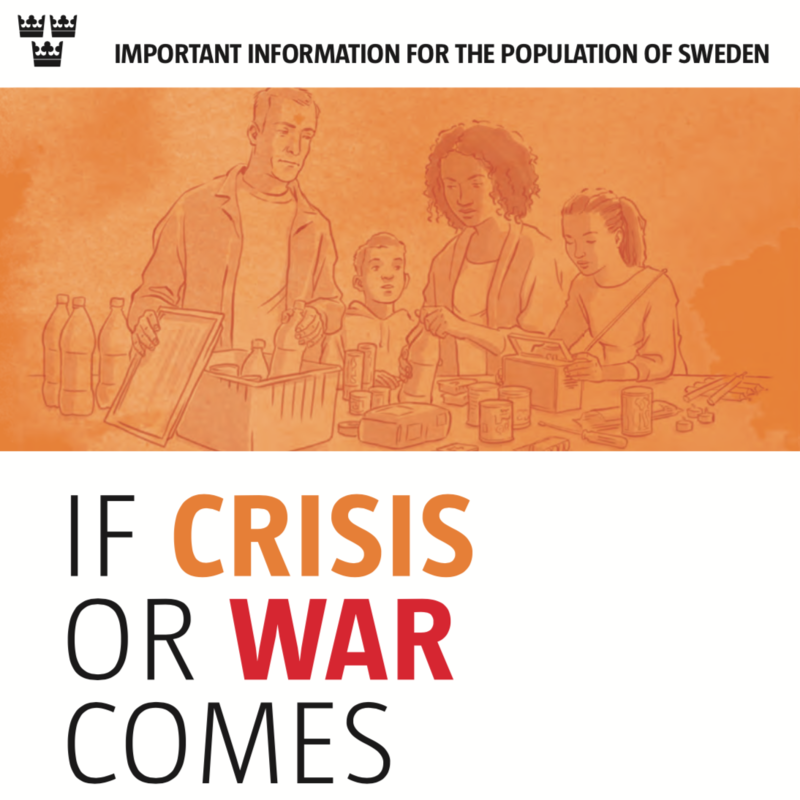 Does Sweden's how-to guide recommend organizing lots of Swedes to lobby the government to stop dealing weapons, get its troops out of Afghanistan, shun NATO, join the new treaty banning nuclear weapons, or provide more aid abroad? These are, in fact, steps that ordinary people can take to deal with war. They are nowhere to be seen in "If Crisis or War Comes." On the contrary, this helpful brochure warns people to avoid large groups -- precisely what they should be forming to nonviolently insist on peaceful policies. In fact, this cutting-edge war advertisement lists alongside war, as something to be "resisted" (apparently in the same general militarized manner) not only terror attacks, and not only cyber attacks (so that war is justified by a claim that someone hacked a computer), but also "attempts to influence Sweden's decision makers or inhabitants" (so that this essay is itself grounds for war). The same brochure also announces the power to erase civil rights by declaring martial law. "If Crisis or War Comes" speaks of military action as "defense" despite its counterproductive history in defending people, and depicts "civil defense" as the responsibility to "support the Armed Forces." Nowhere is there a word about unarmed civilian defense, about non-cooperation, and the tools and abilities of nonviolent resistance to tyranny, or about the superior record of success that nonviolent campaigns have over violent ones. Instead, without ever naming Russia, the Swedish brochure frames "resistance" as a violent but heroic and to-the-death struggle against the foreign evil led by the nefarious Vladimir Putin. The chief result of this is surely the promotion of fear, which damages the ability to think clearly. Another result is that like-minded war promoters in the United States can point to Swedish talk of the "Resistance" as World War II-like glory. The U.S. State Department's spokesperson this week, after all, described D-Day as a moment of great unity between the United States and Germany. The number of people in the United States who know that the Soviet Union was its ally back then would probably fit on a small island off Stockholm. "If Crisis or War Comes" should heed its own Trumpian warning regarding fake news. It is based on a belief in a flood of lies and distortions about Russia that are not given substance by their size and frequency. "Is this factual information or opinion?" the Swedish government asks us to consider. That's good advice.